The Parking Prankster wishes to thank 4consumerrights for bringing this little gem to his notice. 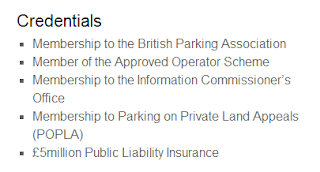 Parking Awareness Services are one of the smaller parking companies, and are members of the IPC rather than the BPA. As part of their niche market service, they offer the option to restrict parking bays to yellow cars. As 4consumerrights succinctly puts it, good luck with that! The Prankster also points out that they really should update their website, unless they are trying to operate a dual membership systems and sometimes use membership of the BPA and POPLA and other times the IPC and the IAS. The Prankster also wonders what 'membership to' actually means, but perhaps this is just him being pedantic, the English language having moved on since he last was at school and studied grammar.